They are found world wide. 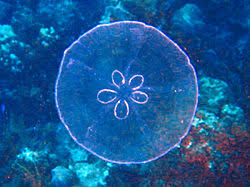 They are mostly found around tropicl warm waters. They like to drift along the curents miles and miles just drifting. Moon jellyfish eat whatever drifts near them. They eat using there tentacles that hang down from the main parts of there body's. They normally eat tiny shrimp fish eggs and microscopic plants.